No one has come close to Sir Don Bradman, and no one ever will. (AP Photo, File). In cricket, a challenging declaration in the second innings is about as close as a captain ever gets to taking a gamble on the field. The opportunity cost of not being able to score more runs is pretty hard to swallow, so it’s not surprising that declarations are a not a frequent occurrence. Nor is it surprising that some have gone spectacularly wrong. On a rain-affected pitch in the first Test of the 1934-35 series, England dismissed the West Indies for a modest total of 102, despite a gritty two-hour knock of 44 by George Headley against some hostile pace and spin on a wet wicket. England went into bat, and despite resistance from Wally Hammond, at the end of the first day were precariously placed at 5-81. Then it rained so much that play restarted only at tea on Day 3. As soon as England came into bat, they lost two wickets, and captain RES Wyatt declared the innings closed at 7-81. From being 3-4 at the start, the West Indies recovered to 3-33 at close of play. And then it rained again. Play restarted at 3pm on the fourth day, the sun shone brightly, and the wicket became even more difficult to negotiate. The Windies got to 6-51 by tea, and at the interval, captain GC Grant decided to declare with a lead of 73, and push for a win on an unplayable pitch. But, difficult as the pitch was, Hammond realised that if he could be stodgy in defence, and play long enough, England could win this. And so they did, with Hammond driving a huge six to bring up a most unlikely victory. It was the first adverse result of a third innings declaration in Test cricket. England and Australia met at Leeds for the fourth Test of the first post-war Ashes series played in England, in what would turn out to be a remarkable match. A rejuvenated 40-year-old Don Bradman led an Australian team eager to achieve a 4-0 sweep. On a perfect wicket, England won the toss, batted first, and scored a mammoth 496. Australia replied with 458, scored at a much faster pace. England again batted extremely well in the second innings, and captain Norman Yardley decided that a target of 404 with 345 minutes on the last day was enough to put pressure on Australia and take a few quick wickets with the heavy roller breaking up the pitch. Things didn’t quite turn out that way however. 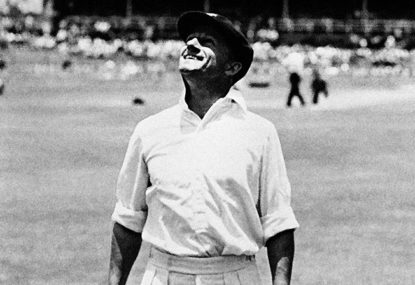 The pitch broke up, and the ball turned awkwardly and lifted, but Bradman received three reprieves from the Englishmen to remain not out on 173 and lead Australia to a famous victory. For the first time in cricket history, a country had scored over 400 runs in the last innings to win a Test match. But it won’t be the last.